An amazing sandwich recipe is the best quick dinner solution. 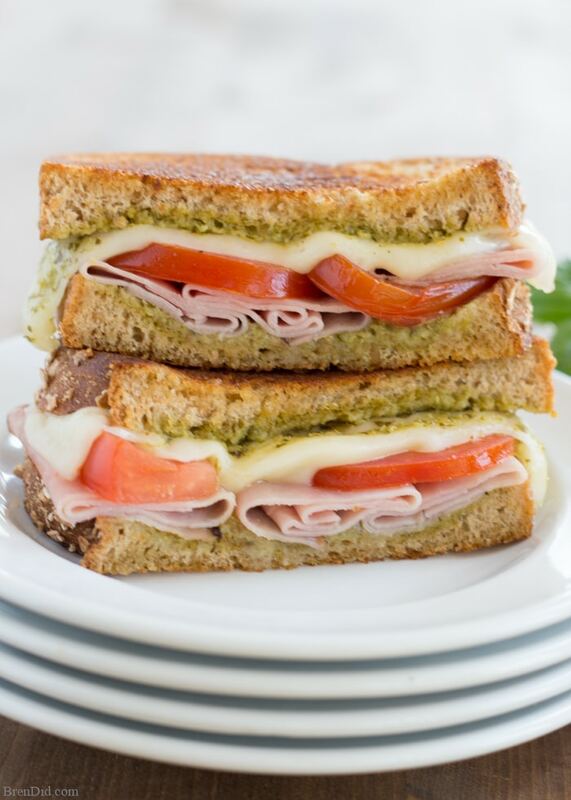 This grilled ham, cheese, and pesto sandwich combination will be a family favorite that can help you resist fast food on busy nights. A special thanks to Pepperidge Farm® Harvest Blends bread for sponsoring this post. This post uses affiliate links. They don’t cost you a thing and help us bring you creative projects. Read more in Policies & Disclosures. This has to be the world’s easiest riddle: What’s better than cheesy ooey-gooey goodness on fresh bread with the flavors of fresh basil and tomato? According to research by Oregon State University, 44 percent of Americans eat pizza as a dinner entrée each week. That’s about 139 million people eating pizza for dinner each week. ONE HUNDRED AND THIRTY NINE MILLION! ONE HUNDRED AND THIRTY NINE MILLION! I LOVE pizza but I also know that fast food pizza is not the best dinner option. Two slices of takeout pizza can add up to 900 calories. Not to mention the sodium… oh, the sodium! Those slices can add more than 2000 mg sodium to your diet. I decided to get my family off the weekly pizza wagon and onto the road to better health. The easiest way we eat healthier is by cooking at home. Of course, it’s much easier said than done… dinner preparation doesn’t always fit into work, school, and sports schedules. Having a quick go-to meal that satisfies the whole family is a great way to resist fast food on busy nights. Be prepared in 10 minutes or less. Use simple ingredients found in our fridge. Sandwiches have always been a go-to lunch at our house, but I rarely served sandwiches for dinner. This grilled ham and cheese masterpiece has reversed the trend. My family BEGS for this simple sandwich recipe… and they’re going to be a hit with your family too! The best ingredients make the best meals and it’s true when making sandwiches as well. To make these ham and pesto sandwiches you need 5 simple ingredients probably have on hand in your kitchen. Delicious basil pesto. I use a basic version from Costco or Trader Joe's. Look for one with no artificial ingredients. Great whole grain bread. 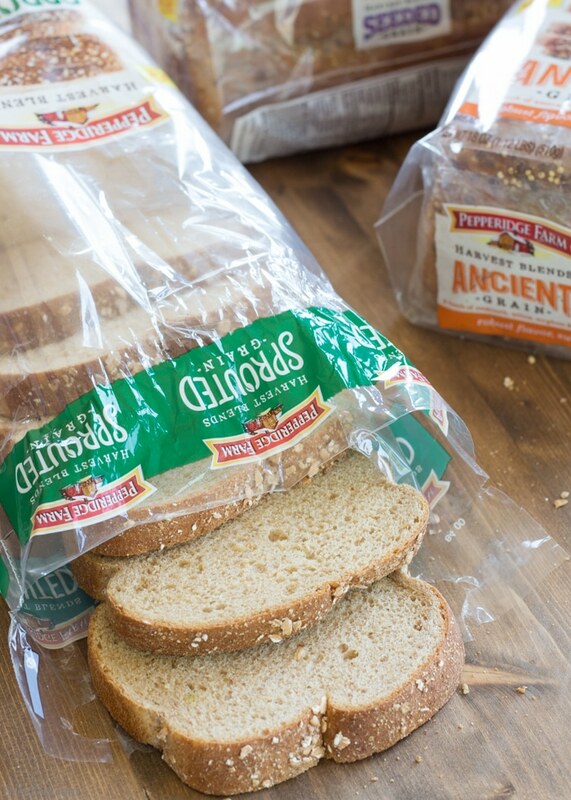 I love Pepperidge Farm® Harvest Blends bread. The delicious Sprouted version is made with flour milled from sprouted wheat and has only 100 calories per slice. It's available at your local Midwest grocer! Lean ham. 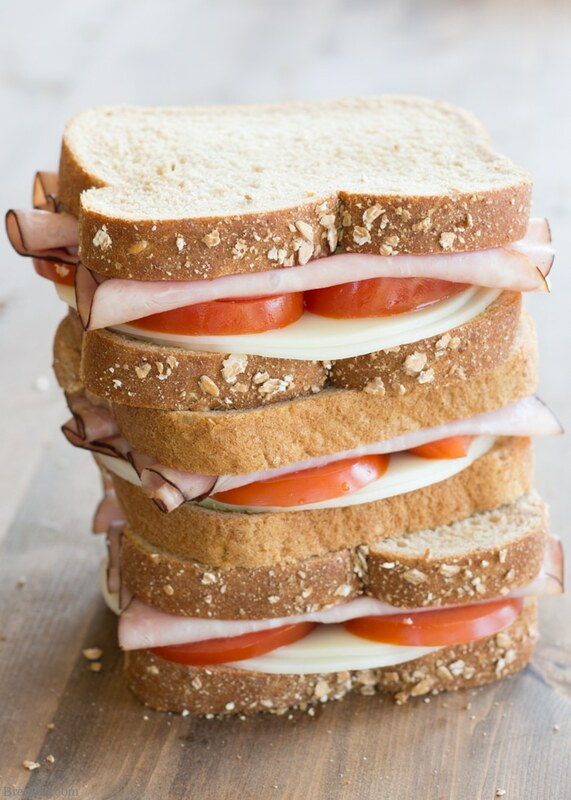 Shaved deli ham adds protein and flavor to the sandwich. My family enjoys Black Forest ham. Red ripe tomato slices. 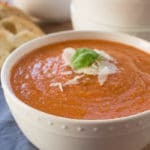 Fresh tomatoes add nutrients, vitamins, and flavor. Get some in season. Thinly sliced provolone cheese. A bit of provolone cheese adds melty goodness and flavor without too many calories. Make this sandwich recipe with a bit of olive oil when grilling instead of butter. Olive oil is better for your health and adds extra flavor to this sandwich. You can spray the bread with oil or brush it on. 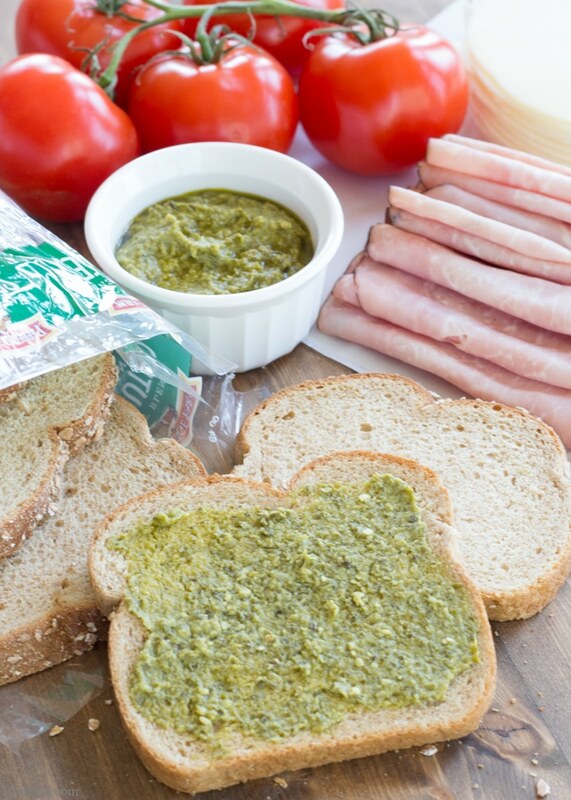 Spread pesto evenly on both slices of bread. 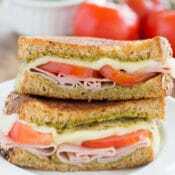 Layer ham, cheese, and tomato on top of pesto. Place sandwich in a hot cast iron skillet and cook until golden brown, about 3 minutes. Flip sandwich and allow the second side to cook until golden brown, about 3 minutes. Make sure to watch sandwich carefully while cooking so it does not burn. You may cook several sandwiches at one time. 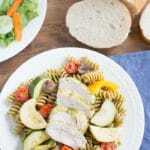 This hearty sandwich recipe adds up to a mere 400 calories and has less than 1000 mg of sodium. 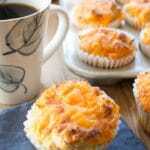 It can be made in just a few minutes and the whole family will love the taste. 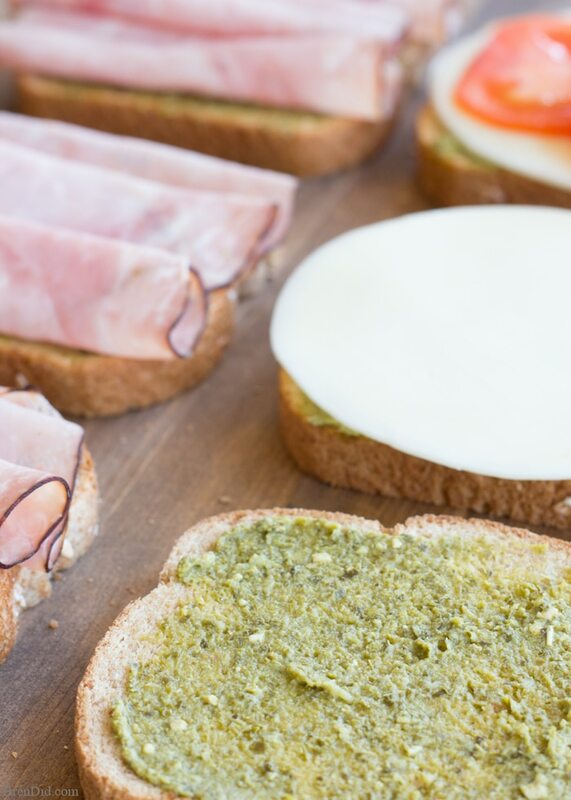 Try replacing some of the pizza in your family’s meal plan with these simple ham and pesto sandwiches. They make dinner preparation easy and can help with a healthy diet. 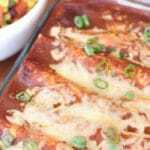 Want more great dinner ideas? Sign up for my newsletter below and never miss a thing! I grow a garden every summer chock full of basil and tomatoes. 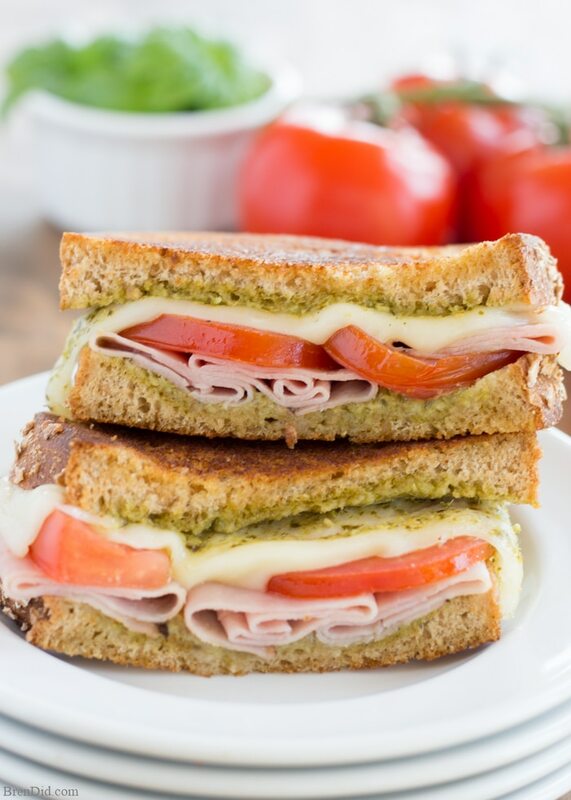 I bet these sandwiches are amazing with garden fresh tomatoes and homemade pesto. Can’t wait until summer to try it!